The first and most recent Air Jordans travel through time. Word of the Jordan MTM (Michael Jordan, Tinker Hatfield, Mark Parker) project first came about when President Obama visited Nike headquarters in Oregon last week. Things have been mum since, but what appears to be a first look at the pack just leaked online. 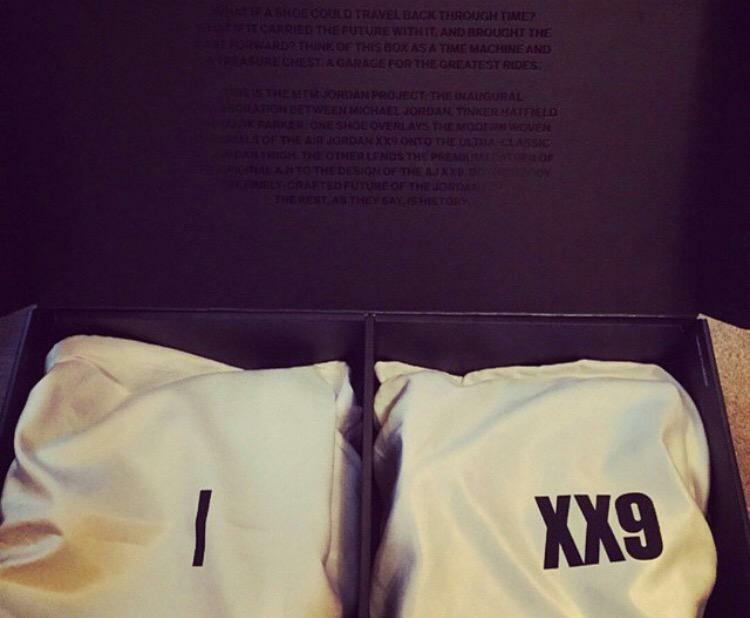 The picture shows 2 pairs of shoes in dust bags that read 'I' and 'XX9.' On the underside of the box lid is a description of the project, which is described as a "time machine." In short, the shoes will be an Air Jordan 1 constructed with the Air Jordan XX9's performance woven upper, along with an Air Jordan XX9 built with premium leather like the Air Jordan 1. As of now, no other photos have surfaced. Look for the Air Jordan MTM Pack to release soon in very limited quantities at select Jordan retail locations.